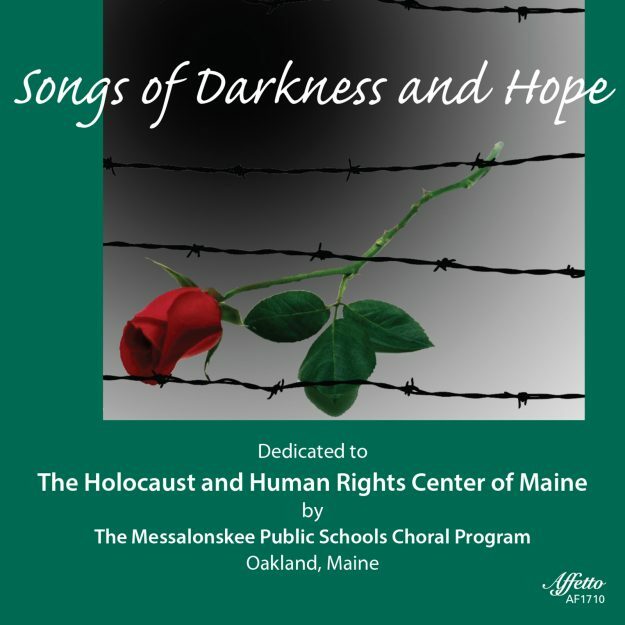 “Songs of Darkness and Hope” was the culmination of a project conceived and created by choral music teacher Pam Rhein of the Meesalonskee Public Schools – Rural School Unit #18 in Oakland Maine for the “Shoah Student Education Initiative” of the Maine State Holocaust and Human Rights Center in the state capital of Augusta. The songs are composed from poems written by interred children found on the walls of concentration camps after WW2, along with a few camp work songs found in the Center’s historical archives. Sung by over 400 students from 5th grade through high school, combined choirs and select auditioned choirs conducted by high school choral teacher Kevin Rhein, the creation of this album was a moving experience in education which changed the lives of those involved, students and teachers alike, many of whom were moved to tears upon hearing the preproduction master. Both Pam and Kevin Rhein, husband and wife, were selected as Maine State Music Teacher of the Year. The uniqueness of this album is due to many aspects relating to the holocaust and human rights, so very important in our world today. It is safe to say that few albums of this nature and significance have ever been produced in such a rural school district, with some of the pieces stunningly performed due to the quality of the music educators in this school district.